Passiflora mollissima growing vine of the genus Passiflora also known as Banana passion fruit, Passiflora mollissima perennial evergreen plant also used as ornamental plant, can grow in tropic, subtropical or mediterranean climate and growing in hardiness zone 10+. Leaves color green the leaves lobed and have 3-5 lobs. Flower color pink with nine petals. 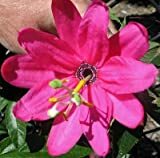 Passiflora mollissima BANANA PASSIONFLOWER Exotic SEEDS! Is it necessary use vegetative reproduction in Passiflora mollissima? What can be done with big quantities of Passiflora mollissima? How long does it take for a Passiflora mollissima to bear?